Home » Lifestyle » Black Friday: Everything Must Go… But Will You? They say that insanity is doing the same thing over and over and expecting different results. I, however, beg to differ. I’m pretty sure the real definition of insanity is getting up at 4 a.m. so you can go to WalMart and risk being trampled to death in order to get 40 bucks off an iPad Mini. 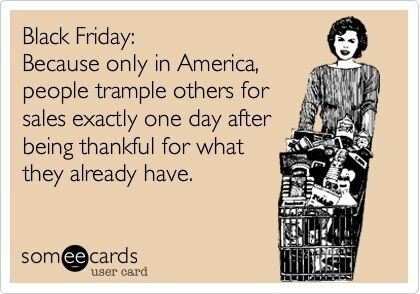 There are some folks for whom Black Friday shopping is actually a Thanksgiving tradition they look forward to more than turkey. For some reason, they hold the occasion in the same regard I have for National Whiskey Day (which, for the uninitiated, is celebrated on March 27th). If you are into Black Friday shopping, don’t miss David Zyla’s Black Friday playbook — everything you need to know to win at shopping — on the November 21 episode of Kroll Call. Get all the details here. So, which side of the Black Friday fence are you on? Will You Be Out Shopping On Black Friday? Wild horses couldn't keep me away... especially if said horse is on sale! I would rather have a root canal without novocaine performed by the Marquis de Sade!